Local officials aren’t letting General Motors get off easy in closing one of the city’s largest tax revenue streams. This Saturday (March 23), a town hall meeting will be held at the public library (2360 Caniff) at 9:30 a.m. to discuss the closing of GM’s Poletown Plant. The closing of the plant will be a financial setback for the city. GM currently pays the city about $850,000 per year in lieu of property taxes. The public school district will also lose about $110,000 per year from the plant’s closing. City officials want the plant to remain open, but barring that, they want GM to do something with the site so it won’t remain vacant and thereby not producing needed revenue for the city. So far, GM isn’t saying what its plan is, but that the issue will be a matter of discussion with the UAW when new contract talks begin in September. What rubs some folks wrong about the closing is that thousands of Detroit residents and business owners were forced to sell their properties to make way for the plant. That happened in the mid-1980s, and caused much emotional turmoil. The plant is just 34 years old, and it’s been baffling for some to figure out why GM is so eager to shut it down after all the fuss that went into building it. Another rub is that the U.S. government spent about $80 billion of taxpayers’ money to bail out GM during the economic downturn in 2008. Without the bailout, GM would have likely gone out of business, resulting in the loss of thousands of jobs. GM has paid all but $11 billion back from that bailout. According to the city, GM posted a $2.8 billion profit recently. The Poletown Plant is one of four plants being closed in the U.S., as well as another one in Canada. In each of these communities, the closings are causing folks to panic about their financial futures. City officials want to hear from the public as to what they should tell GM. I hope the appearing civic leaders advance some cogent arguments. Former U.S. presidential candidate and leftist Jerry White showed up and delivered a scorching diatribe against the UAW leadership – singling out former veep Norwood Jewell and the recent criminal probe against him and other UAW officials. He got in a rancorous shouting match with a UAW member in the audience. Overall, well attended by elected officials and the public. Actually most people living in Hamtramck will be more than happy to pay a few more dollars on their tax bill to get rid of this pollution producing plant. Potential health benefits to people living around it far outweighs the money being generated by such plant. GM should be given an award for their decision and the area should be turned into a more environmentally friendly use. The push to make General Motors to keep the Poletown plant open begs to ask the intelligence level of some city officials. If you want to force GM to keep the plant open, why didn’t you try to force the owners of numerous businesses along Jos Campau to remain open? Same logic. The little guys also paid taxes to the city. So I guess there’s no principal involved, just the amount of money. Maybe these same officials should try to find other windmills to tilt at. Businesses in Hamtramck are lucky enough if only the city stops harassing them. Nasr Hussain what harassment are you talking about? Does the $800,000 in projected lost annual revenue from General Motors include personal city income tax from hourly workers at the plant – and if not – how much more revenue is the city losing in these regards? Has there been an impact study of other areas that may be affected by the Poletown idling – such as loss of revenue for local businesses that rely to some extent on the operation of the Poletown plant? – such areas could be restaurants and shops that workers may frequent on their off hours? Why did Andrea Karpinski NOT attend the Town Hall meeting this Saturday at the library when other City Council members appeared? Is the UAW planning any legal action against GM as the result of this proposed idling of Poletown as they have with regards to Lordstown and Warren Transmission? Has anyone reached out to the Trump administration for help given the fact that President Trump has singled out the Lordstown closing for his wrath? Has City Manager Kathy Angerer done anything concrete to use her Lansing contacts to help stop the proposed idling at Poletown? What is the UAW doing right now to help the situation at Poletown? Does the City of Detroit, who stands to suffer an economic impact if Poletown idles, plan to do anything to prevent such an idling? What has the city administration done to encourage other businesses to stay operating within Hamtramck? How much blame can be cast upon Mayor Majewski and City Council for the current fiasco that is about to happen to municipal finances if Poletown idles? 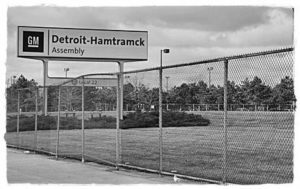 In the event of an idling, will General Motors still be making any payments by way of property taxes to the City of Hamtramck? Answer these questions, City of Hamtown. Hamtramck is getting cleaner air. And why not extend Downtown Development Authority resources to businesses outside the Joseph Campau Avenue corridor? The previous argument was that the rules regarding DDA support for local businesses were limited to one contiguous area – but this argument proved to be false as the true state of affairs is that DDA funding can be used to improve non-contiguous areas at a time. The real reason some believe that this fallacious argument had been advanced was to deny DDA resources to the predominantly Arab and Bengali-owned small businesses that are located in and around Conant Avenue. Arab and Bengali business owners locally should be screaming and pounding the table for DDA support.